Western blot analysis of extracts from human skeletal muscle using ATP2A1/SERCA1 (L24) Antibody. 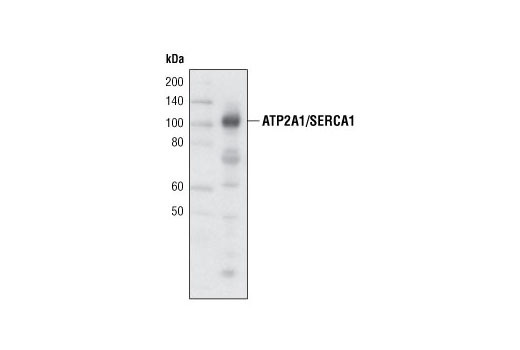 ATP2A1/SERCA1 (L24) Antibody detects endogenous levels of total ATP2A1/SERCA1 protein. Polyclonal antibodies are produced by immunizing animals with a synthetic peptide corresponding to residues surrounding Leu24 of human ATP2A1/SERCA1 protein. Antibodies are purified by protein A and peptide affinity chromatography. Sarcoplasmic and endoplasmic reticulum Ca2+ ATPases (SERCA) are members of a highly conserved family of Ca2+ pumps (1). SERCA pumps transport Ca2+ from the cytosol to the sarcoplasmic and endoplasmic reticulum lumen against a large concentration gradient (1). ATP2A1 (SERCA1) is a fast-twitch, skeletal muscle sarcoplasmic reticulum Ca2+ ATPase (2). Research studies have shown that mutations in the ATP2A1 gene cause an autosomal recessive muscle disorder known as Brody myopathy, which is characterized by muscle cramping and impaired muscle relaxation associated with exercise (1-3). Hovnanian, A. (2007) Subcell Biochem 45, 337-63. Odermatt, A. et al. (1996) Nat Genet 14, 191-4. Odermatt, A. et al. (2000) Hum Genet 106, 482-91.